Jones suggested that superintendents could induce compliance by holding back rations and required a report on the progress of these efforts by June 30, 1902. The red man has neither newspapers, letters, books, nor games to break the monotony of his life. He loves company. He gets all his news, all his pleasures, in daily contact with his fellows. He has always lived in a village. The bureau tried for decades to eliminate ceremonial dances. By the 1920s, however, more and more tribes held annual gatherings based on these traditions, which survived despite the BIA’s disapproval. Letter from William Jones to Superintendent, Round Valley, CA. National Archives, Records of the Bureau of Indian Affairs. Now here are some other models that illustrate the typical Indigenous views of survival, development (seen to be about more than economics) and sustainability that differ markedly from those typical of Western, Eurocentric and in particular capitalist economies. The economy is seen as an inseparable part of the total society. Present-day activities are always with the Seventh future generation and sustainability in mind. Spirituality is seen as a key ingredient in both social stability and development. The types of goods and services and their impacts and implications on the survival of the culture, along with the true costs of producing and distributing them are considered critical factors in the basic decisions of What, How and For Whom to produce and distribute the means of subsistence. These core values of course do not represent the values of all members of each group held and practiced respectively, but are meant to represent and convey fair generalizations of some of the different traditions and core values celebrated in the literature and traditions of the respective systems and cultures—Eurocentric and capitalist vs. Indigenous and communalist—that are typically presented and advocated by their advocates and adherents. It is very clear from the internal documents of the U.S. and Canadian Governments, as well as from the internal documents, diaries and memoirs of the missionaries and “Indian Agents”, that the core and defining values, institutions, practices, priorities, relationships and other dimensions of the culture of Indigenous nations, were not simply regarded and dismissed as “inferior” or backward; rather, they were first and foremost regarded as direct challenges (without any evangelical intentions by Indigenous Peoples to do so) to the core values, practices, relations, theologies and institutions—cultures—of capitalism and those of the settlers. Just as some capitalist nations have regarded the mere existence of socialism and socialist values as an existential threat, without any alleged overt or covert acts of aggression by socialist social formations like China, so Indigenous cultures and systems, with definite communalist and non-capitalist practices and values, were regarded as existential threats and banned. Even many Indigenous prayers, with communalist values, were seen as a threat to cultures—and interests—built on capitalism. Here are but two of many examples from the archives of the Department of Indian Affairs in Canada and the Bureau of Indian Affairs in the U.S. that show the real nature and intentions of their policies. For example, in many traditional societies, there is the sacred practice of “Potlatch” or “Give Aways” (Blackfoot) in which prized personal possessions are given away; they are not, by the way forms of “gambling” or “lotteries”. 1. That the Indian form of gambling[sic] and lottery[sic] known as the “ituranpi” (translated “Give Away”) be prohibited. 5. That there be close cooperation between the Government employees and the missionaries in those matters which affect the moral welfare of Indians. …After a conscientious study of the dance situation in his jurisdiction, the efforts of every superintendent must persistently encourage and emphasize the Indian’s attention to these political, useful, thrifty, and orderly activities that are indispensable to his well-being and that underlie the preservation of his race in the midst of complex and highly competitive conditions. Hitler’s concept of concentration camps as well as the practicality of genocide owed much, so he claimed, to his studies of English and United States history. He admired the camps for Boer prisoners in South Africa And for the Indians in the Wild West; and often praised to his inner circle the efficiency of America’s extermination-by starvation and uneven combat-of the ‘Red Savages’ who could not be tamed by captivity. Thus it has been made clear by the U.S. and Canadian governments that Indigenous institutions, values and practices, Indigenous cultures and systems, are considered not only as “existential threats” to their own orders, institutions and values, but are considered fundamentally inconsistent with what they define as economic growth and development and the fundamental conditions and ingredients necessary for economic growth and overall development. Now let’s explore the model of Indigenous development and sustainability given below. 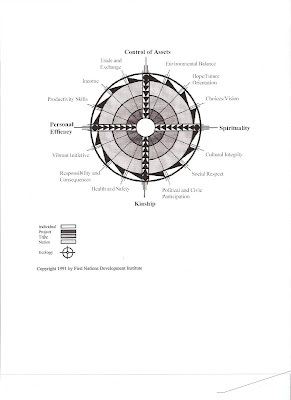 The first thing that must be noticed is the four points of the model that correspond with the four primary directions of the compass: North, or Control of Assets; East, or Spirituality; South, or Kinship; and West, or Personal Efficacy. These imperatives are considered fundamental to overall development and sustainability in Indigenous terms. Why are these four core values and imperatives considered fundamental to development and sustainability in Indigenous terms? There is an old saying that sums it up: “It is better to know where to go and not know how, than to know how to go and not know where.” Technology, “Capital” even “land” and “Labor”, are part of the how to go and not where to go. Without Sovereignty and Control of Assets and critical resources, without Vision informed by Spirituality , without Kinship and healthy families and Clans and Bands, without Personal Efficacy (health and viability) of individuals, no nation, especially one surrounded by hostile forces that consider its mere existence a “threat” of some sort, will grow, develop or even survive and be sustained. Social systems engineering, to which all Indigenous nations, along with socialist nations like China have been subject, involves putting targeted nations under such siege from external and internal pressures that have been manufactured and/or exacerbated, that the targeted nation winds up in a straight jacket, forced to divert precious scarce resources into defense and away from development and sustainability, that the targeted nation appears to “conform”, and thus the “proof” has been engineered, of the caricatures that have been made of that targeted nation: “backward”; “repressive”; “inefficient”; “undemocratic”; “stagnant” etc. But in a fair fight, or peaceful competition between systems, socialism beats capitalism any day, even in terms of capitalism’s own definitions and measurements of “efficiency”, just as traditional Indigenous societies beat modern-day assimilated BIA-DIA controlled and capitalist influenced Indigenous societies, in terms of all the requisite ingredients to development and sustainability shown in the traditional Indigenous model of development and sustainability, any day.